The tree is a work in progress. Some surname pages also have smaller versions. Please let me know if I've goofed up some relationsor just write to say, "Hi" if we have some in common. I was privileged to know my grandparents. I spent hours with each of them, listening as they described life in the early part of the 20th century. They told me stories about courtship, marriage, and raising their children. They spoke of their joys and sorrows, and about loved ones who had gone on before, those whom I had never met. 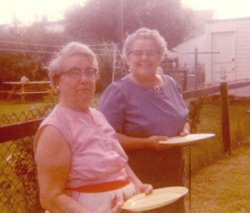 Rose Bertand Lang and Ariel Watson Billings in 1969 My Grandma Lang told me about Calumet, Michigan, and the miners, of being a young French-Canadian girl living in the "big house" with her Irish husband and his large family. She spoke of the Great Depression and taught me how to make Cornish pasties. My Grandma Billings told me about her mother's tragic life: after bearing 10 children in as many years (with only two surviving), she died at 30. She spoke lovingly of her tough German-speaking grandmother, Eliza Schmachtenberger, and her grandpa, Hiram Rushton, and told me wonderful stories of her new life with them after the death of her mother. Grandma and Grandpa Lang were married 47 years when he died in 1967. 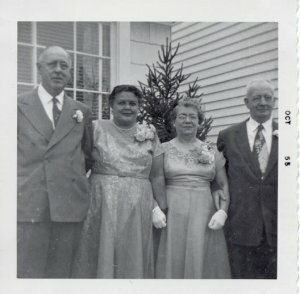 When my Grandfather Billings died in 1975, he and my Grandma Ariel had celebrated 55 years together. Despite many years with their men, both grandmothers often spoke of their love for them. They often told me stories of how they met their mates and fondly remembered anecdotes about their early years of marriage. My grandfather Billings also told me stories. Along with the wild tales about wrestling bears in his youth, he told me again and again about the day he met his special girl and pulled her hair in the picture show. He knew when he met her that she was the one for him. My grandparents and their tales of the past helped me to understand myself and my place in the world. I want to preserve the memories, stories, and pictures of these special people and those who went before them for future generations. This site allows me to display the many ancestors who are a part of my heritage, for myself and for the new friends and family I have met and continue to meet on my journey into the past. Copyright © 2001-2010 Katherine Palmer. All rights reserved.